“What’s this? What’s this? There’s color everywhere… What’s this? There’s white things in the air. What’s this?” Did Danny Elfman’s catchy tune from A Nightmare Before Christmas just start playing in your head as you read that? If so, you’re in for one spooktacular treat today, designed by Fandom Affairs! 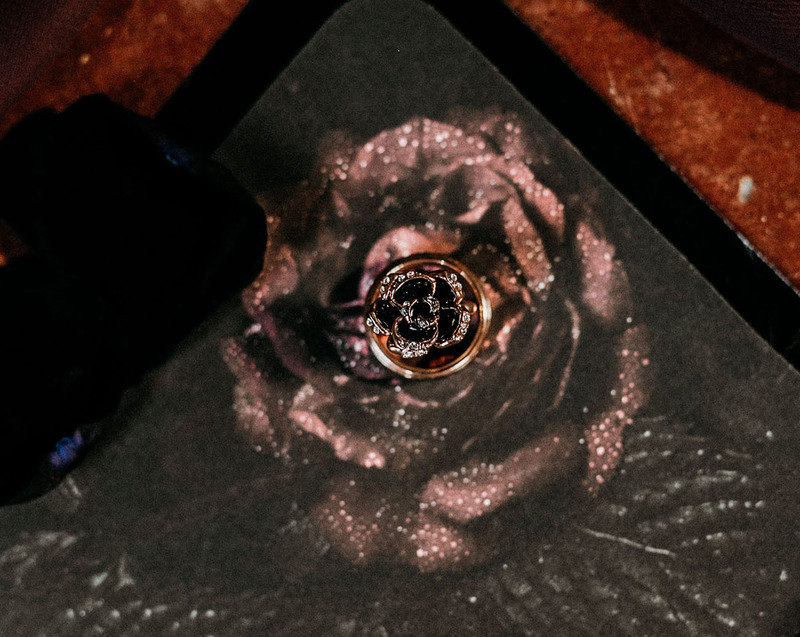 Taking a note or two from the diaries of Tim Burton, this moody editorial features haunting details inspired by Sleepy Holly, Sweeney Todd, Beetlejuice, and more. 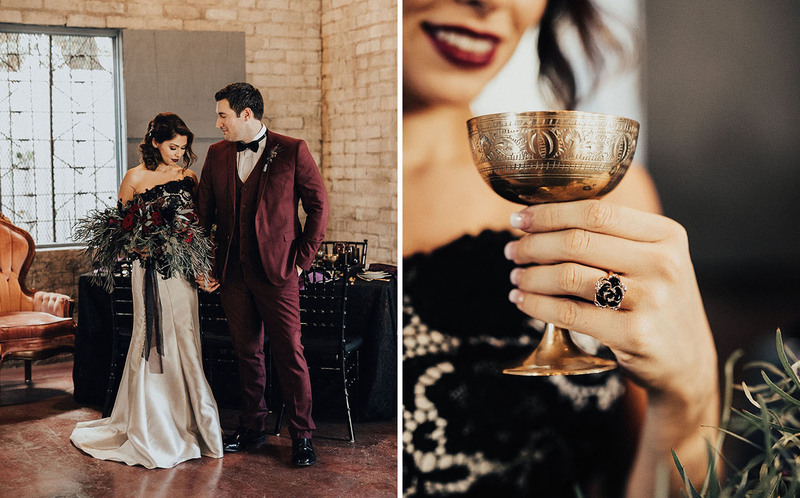 If you’re familiar with Tim Burton’s style, you know that he’s got a penchant for doing things a bit darker, bringing out eerie, yet romantic, feelings and intriguing shapes + designs. 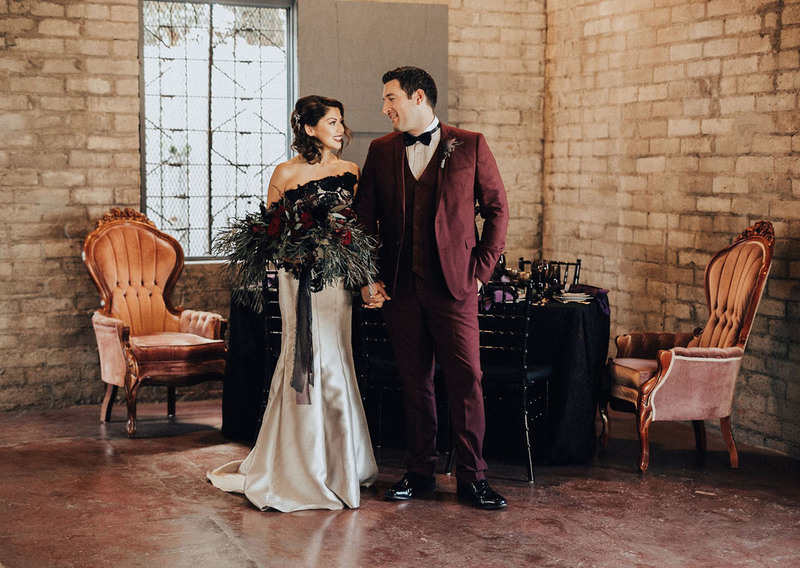 He developed his own signature style, stuck to it, and always does things his way… For that reason, we think Tim Burton is very on-brand with our belief at GWS: couples should create something uniquely their own, focus on their style, and do weddings their way! Let’s take a step into the world of Tim Burton + see all the chic interpretations of his classic films, captured by With Love by Georgie! 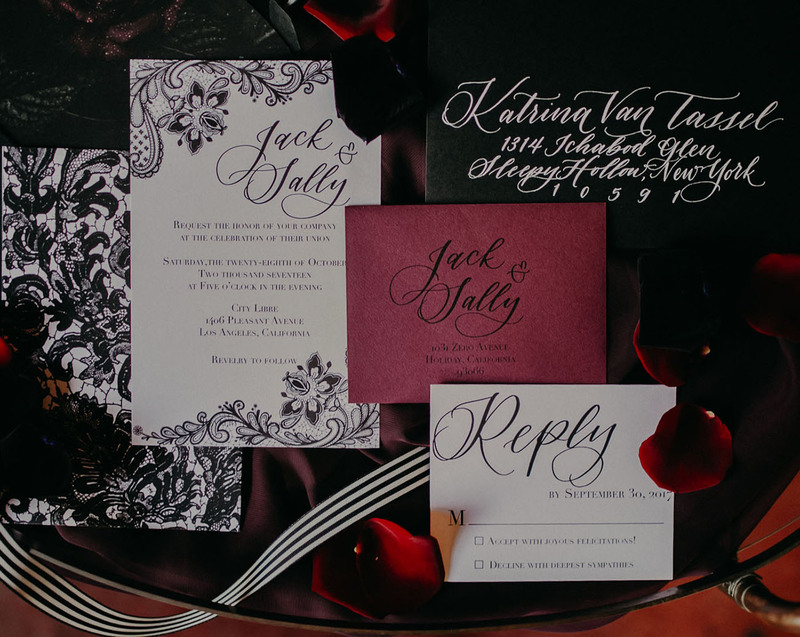 Of course, Jack & Sally would be the couple of the day… :) Requesting your joyous presence to all the mischief + revelry, Calligraphy Nerd crafted this invitation suite with delicate lace detailing. 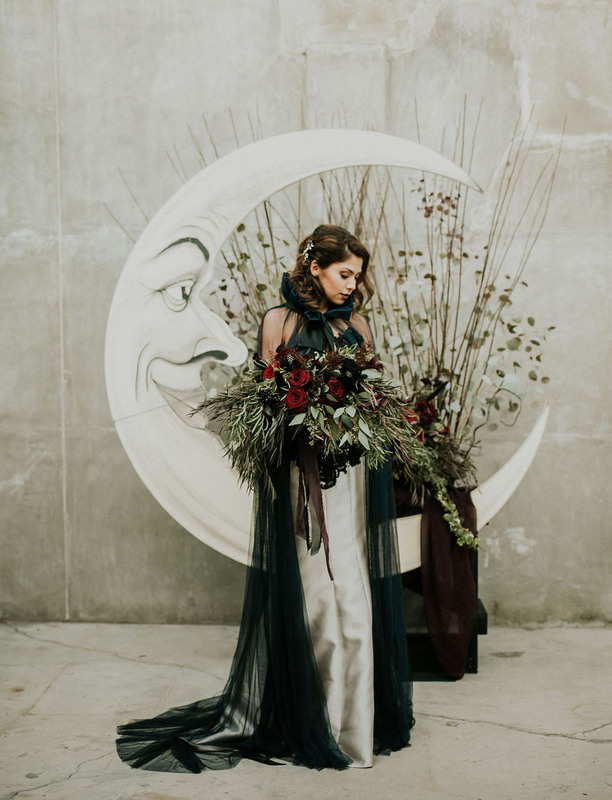 Can we take a moment to appreciate that beautiful crescent moon backdrop, brimming with florals from Bridezilla Events? 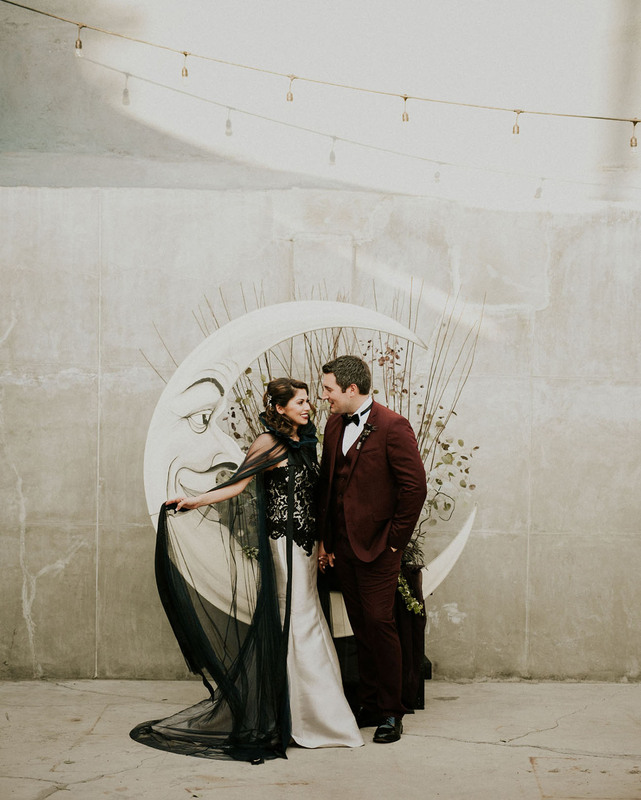 Paper Moon Shoppe provided this bad boy and we can’t help but dance with delight over it’s nod to Art Nouveau designs. 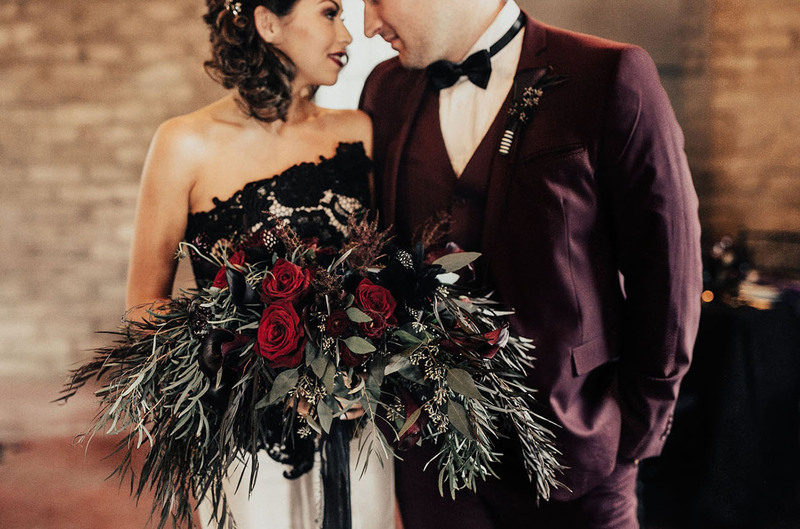 We LOVE the chic interpretation of Beetlejuice’s burgundy wedding attire, reflected in the groom’s ASOS suit. 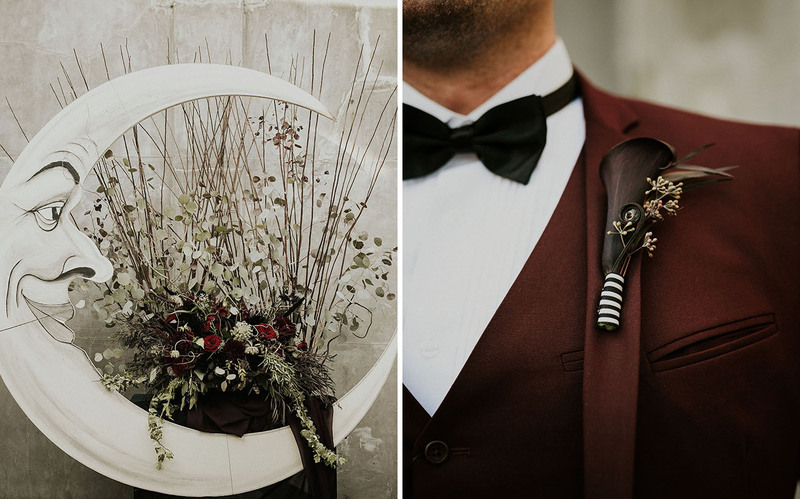 The classic black and white pinstripes are subtly tied into the groom’s boutonnière from Bridezilla Events. 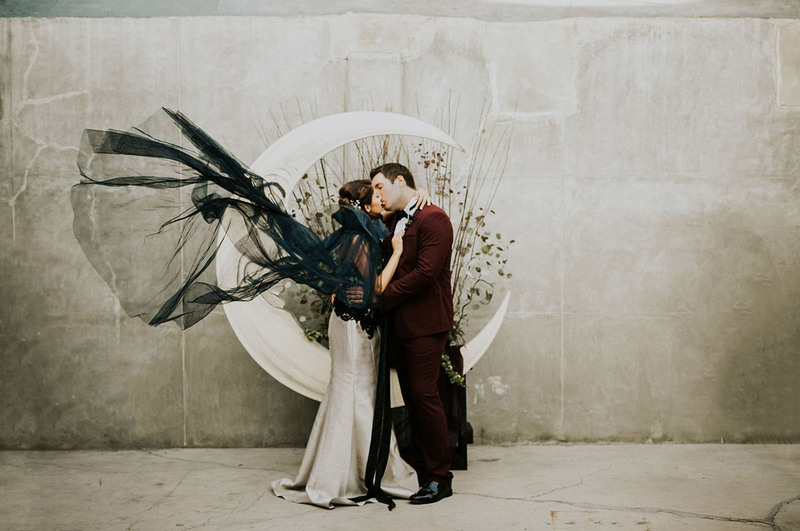 A major standout: this gorgeous high-collared tulle cape the bride donned from Adina’s Bridal. 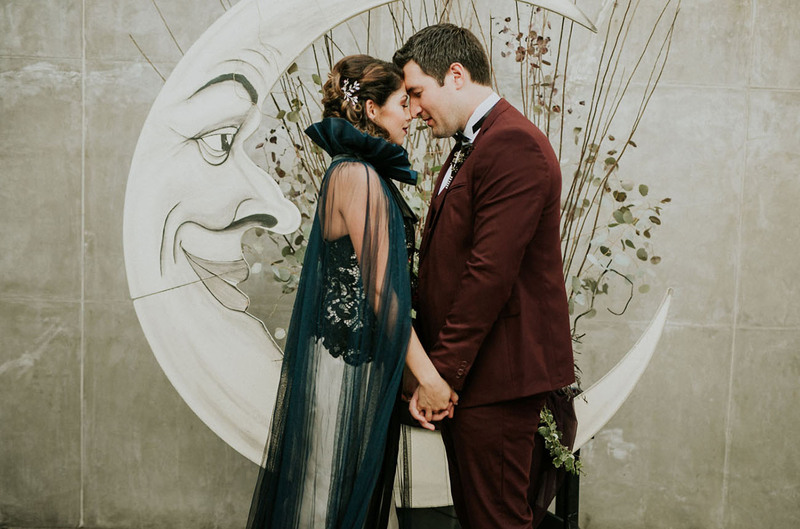 It’s the perfect alternative to a traditional veil, and fits in beautifully with the Tim Burton world. 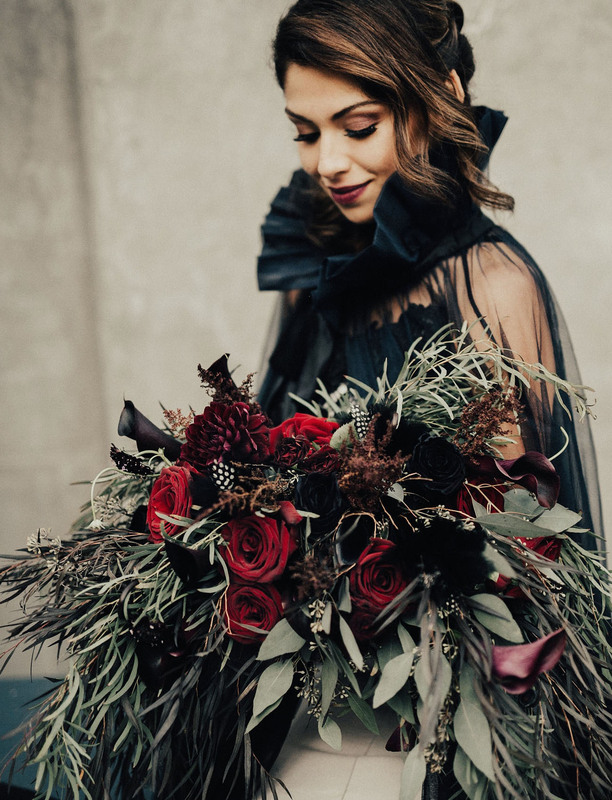 The touch of black in the bride’s bodice was just enough of a twist to complete the look. To complement the overall moody tones of the day and bride’s coy smile, Mobile Bridal Salon crafted one sultry look for the day! Have a little Beetlejuice… So clever!! Especially with the striped black and white straw! 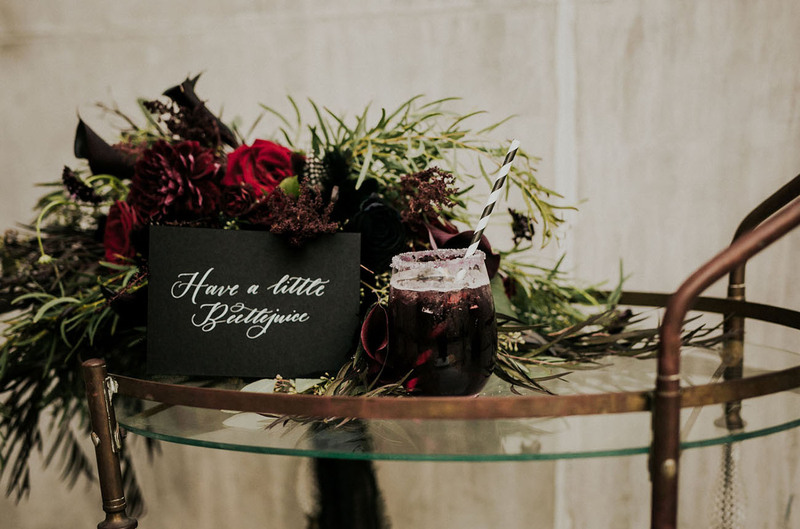 The reception table was a breathtaking masterpiece with its many subtle details. 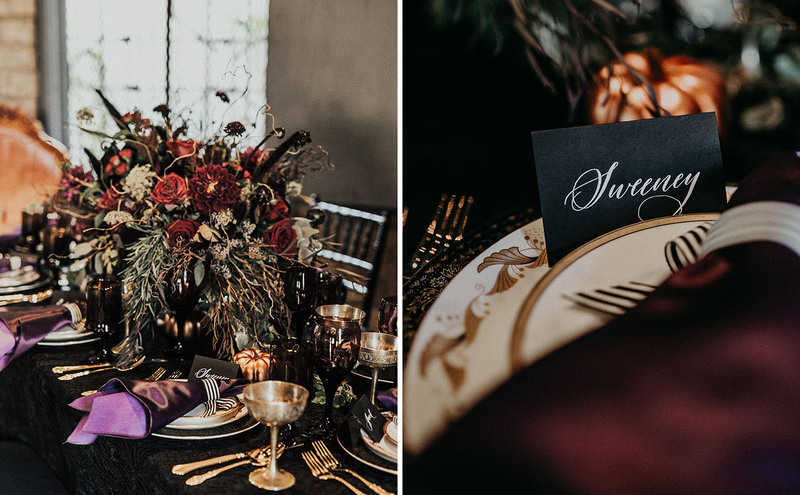 Starting with the oversized upholstered chairs by Provenance Rentals flanking either side of the table; the black and gold trimmed plates accented by brass coupes added a level of luxury, which tied in seamlessly with the rich linens. 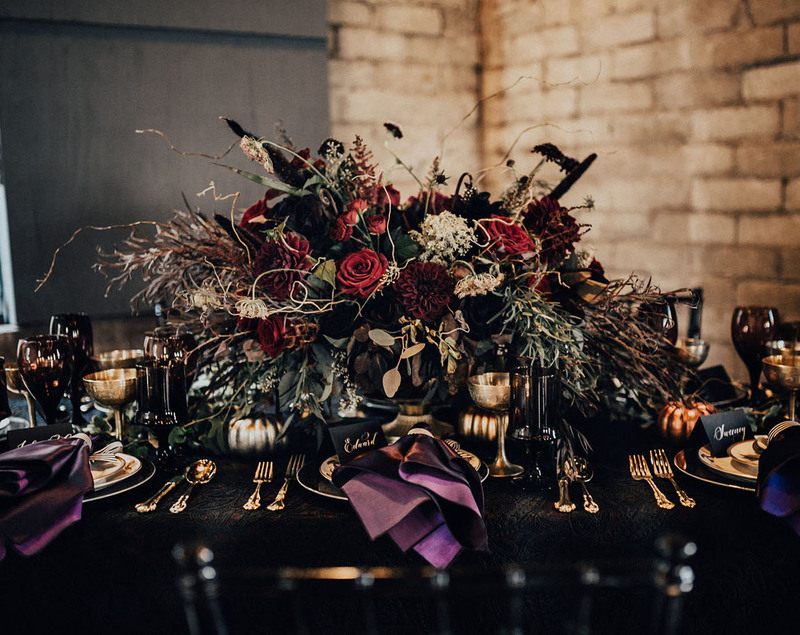 The impressive floral centerpiece by Bridezilla Events struck the perfect balance of abundant blooms with greenery and the eerie feeling of the weed-like vines slowly taking over the table. The design was finished with a Sugar Studio cake fit for “The Pumpkin King” himself! So wicked + so cool!! 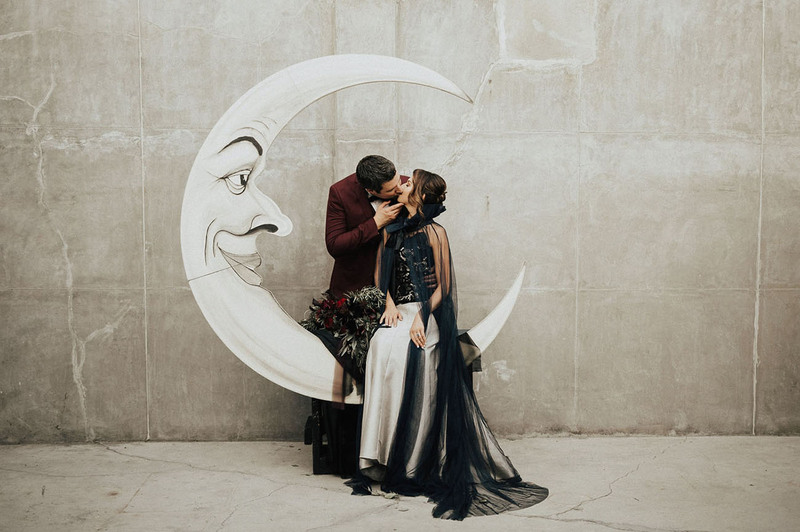 Who else is loving this fantastical Tim Burton wedding inspiration? To dive deeper into his world of mystical creations, take a peek at this clip captured by August McCue Films! Thank you so much for featuring our work! 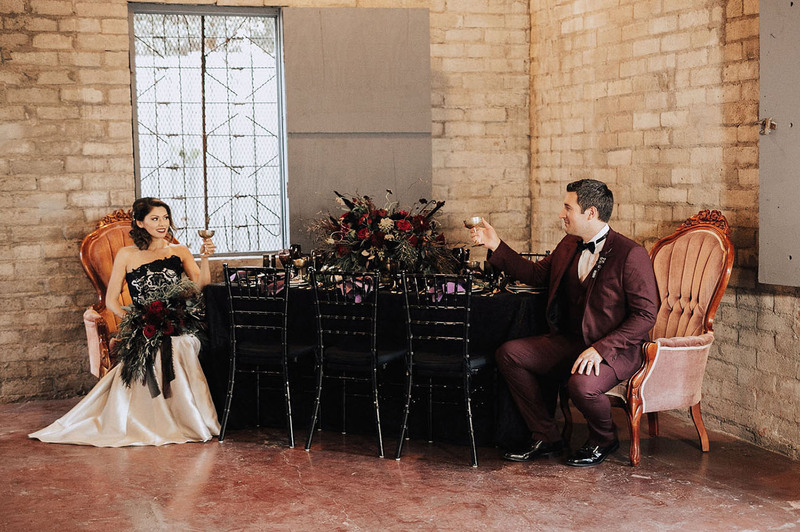 We had so much fun planning and designing this inspirational wedding. Thank you so much GWS for the feature! We are so thrilled to be published on your site. 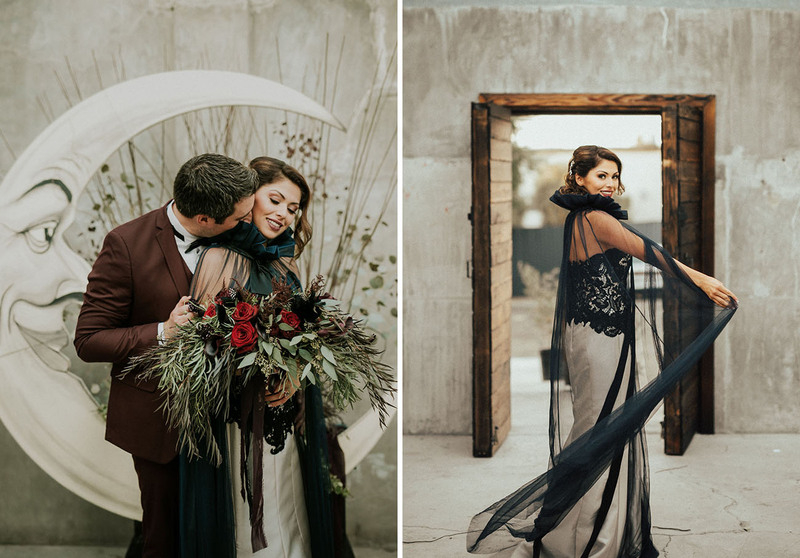 What a beautiful and creative wedding! There are some unforgettable images here! Absolutely love this! 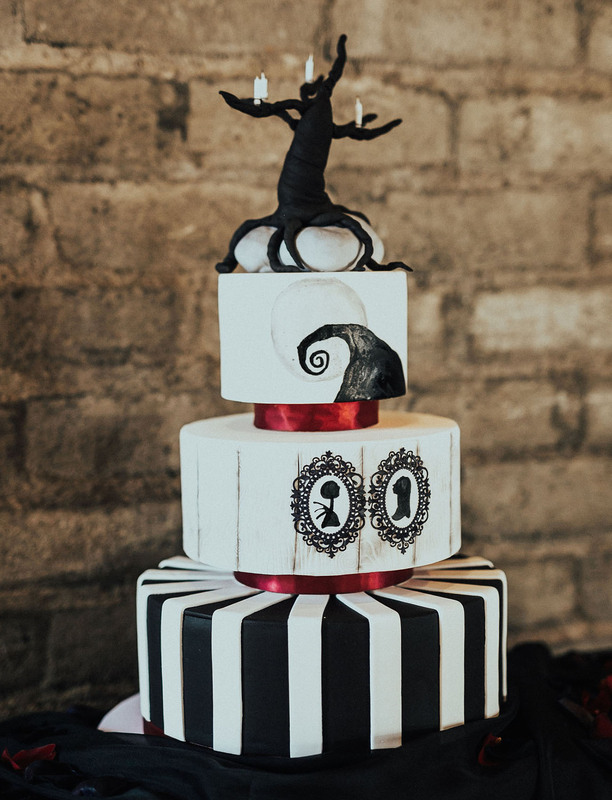 The Tim Burton theme may not be a conventional wedding theme, but when done well like this, it is so stunning. 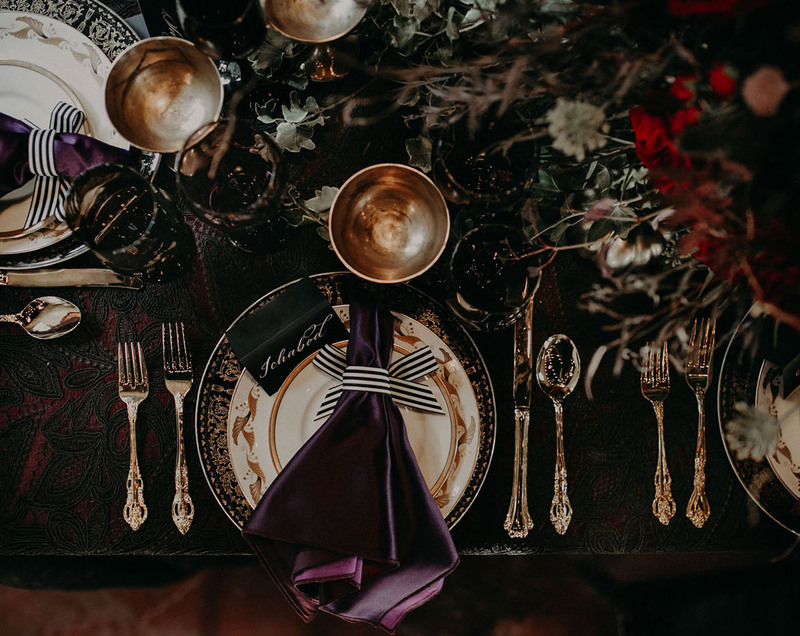 Love the style choices they made to make the whole wedding match the theme without being overdone. Perfect. Thanks for sharing! This is really good. Great photography! Very spooky yet so elegant! Gorgeous couple! Congratulations and best wishes! Love it! What is the song in the video. Shazam is stupid!